Dr. Michael Geary qualified from the National University of Ireland Galway in 1989. His specialist work in Obstetrics and Gynaecology has been undertaken in Dublin, London and Toronto. He works primarily in the area of maternal-fetal medicine and high-risk obstetrics. Michael held the position of Master of the Rotunda from 2002 to 2008. After initial training in the specialty in Ireland, Michael did further postgraduate training in the UK. While conducting clinical research at University College Hospital London, he completed his medical doctorate. After completing his specialist training he did sub-specialty training in Maternal Fetal Medicine at the University of Toronto. Michael has Fellowships from the Royal Colleges in both the UK and Ireland, and is certified in Advanced Obstetric Ultrasound by the Royal College of Obstetricians and Gynaecologists and the Royal College of Radiologists. Michael was appointed Chief Executive Officer/Master of the Rotunda Hospital in Dublin January 2002 and has held academic appointments as Professor at Trinity College and the Royal College of Surgeons in Ireland. During his seven-year term as Master, he was instrumental in leading the team to many new clinical and quality improvement innovations in order to enhance patient care. 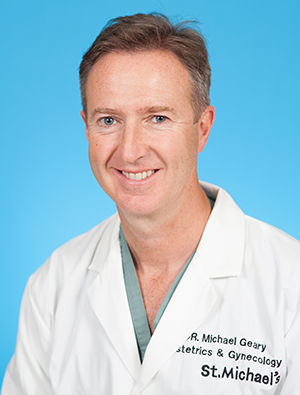 Following this term, Michael worked as a consultant at the Rotunda before taking up the post of Chief of Obstetrics & Gynaecology at St. Michael’s Hospital in Toronto and Professor of Obstetrics & Gynaecology at the University of Toronto in 2014. While working as a sub-specialist in maternal fetal medicine at St Michael’s, he was the Lead for Obstetrics on the Quality Improvement & Patient Safety committee at the university. During this time he was very closely involved with the Southern Ontario Obstetric Network and focused on quality improvement initiatives across the region. Recognizing the power of academic partnership, Michael is particularly interested in fostering research collaborations nationally and internationally and was a founding member of the highly successful Perinatal Ireland Research Consortium. Throughout his career, he has led and collaborated in a large number of research programs, including international randomized trials and cohort studies. His research interests are wide-ranging including fetal growth, labour, and high-risk pregnancy in general. He has supervised and mentored numerous trainees in research, many of whom have completed medical doctorates. He has received many academic awards at national and international level. Michael returned to the Rotunda in Ireland in September 2017 as Consultant in Obstetrics & Gynaecology, and has also been appointed Director of Labour & Delivery, with a focus on quality improvement and risk management. He has resumed his position as Professor of Obstetrics & Gynaecology at the Royal College of Surgeons in Ireland and continues to hold an honorary academic appointment as Professor of Obstetrics & Gynaecology at the University of Toronto.